Sable – a fur animal – is valued primarily for its fur, which is not without reason called the king. The cost of one sable skin comes to $ 1500. Approximately the same estimated live cub, put up for sale as a pet. However, the greatest value – hunting excitement. The sable hunt is varied – the animal is poisoned by dogs, smoked, trapped and swept over it . And let the size of a small beast, the hunt for it brings great pleasure. Sable, taiga beast, is considered to be exclusively Russian beast. Its habitat is mountainous and flat taiga, which stretches from the Ural Mountains and Altai to the Pacific Ocean . Here, in the roots of cedar, spruce and fir, in the hollows of fallen trees and stone scree, sable found refuge. The color of the animal differs depending on the species . Most often, the color of his skin is light brown, sometimes dark brown, but with a constant light yellow spot on his chest. Only black and white sable, the most rare species, are deprived of this ornament . Like any member of the family Mustelidae, sable is a predator . The basis of its diet are mice, squirrels, rabbits, and hazel grouse and wood-grouse are considered a special delicacy. He does not disdain fish and pine nuts. Despite its small size – about 70 cm from the nose to the tip of the tail – the animal is very strong and agile. With developed hearing and smell, sable is not seen very well. The peak of its activity occurs in the morning and evening , it was then that the hunt for sable brings the best result. Over the past centuries, sable hunting has evolved from a vital necessity into a craft, a business. However, an amateur hunter will find his charm in this lesson. The hunting methods, having undergone some changes over time, are basically the same as those used by Siberian men since antiquity. Commercial sable prey begins in winter, when the animal’s fur is especially beautiful. Summer sable fur is much lower than the winter one – it is much shorter and hair less. 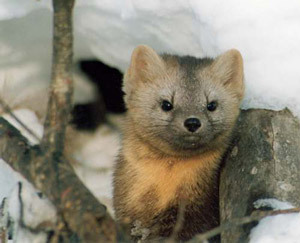 In the fall and spring, sable hunting is not conducted due to seasonal moulting, due to which the quality of the fur becomes extremely unsatisfactory – the felted wool falls out of each touch. The choice of weapons also has its own subtleties . Most often, sables are ridden with a Squirrel type gun, which is charged with both shot and small-caliber cartridges. As ammunition fit calibers 12, 16, 20, but with a reduced charge. Some of the methods of hunting are more effective, others have already lost their relevance . For example, the chance to get a sable, chasing it with dogs (huskies) or catching a trap / samolovom (kulemka), is large enough, while snares and nets give the result only half the time. However, if the result is not so important for the hunter as the pleasure from the hunt itself, then it is worth trying all the methods, despite their effectiveness. The chase is the most productive sable hunt . And the most pleasant for the hunter, because in the process of the chase the excitement wakes up. Sable is a cunning beast, therefore a hunter needs a dog that is appropriate – with a good upper sense, hearing and vision. 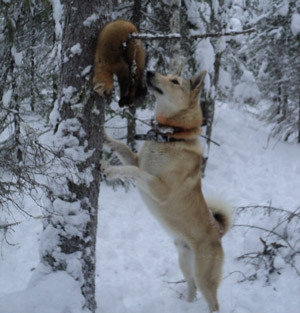 All these qualities are combined in a squirrel dog – like. It is she who is the most faithful assistant in the hunt for sable. It is the task of the dog to take the trail of the beast and, after walking along it, drive the sable to the tree . Squeeze the beast is extremely undesirable, because of this spoils such a valuable skin. But even from the sable tree, especially those who climbed into the hollow, still have to be removed. Seeing the dog, the sable rushes headlong to run. Most often, he runs downhill, easily making his way through the forest debris. However, if the snow is loose, the animal can go astride, and here the dog can use the upper instinct – sobol costs nothing, climbing onto a tree, descend from the opposite side and leave on its own old trail. Having driven a sable on a tree, you should not hesitate . Some, especially cunning and bold animals, jump down to the ground and throw themselves at the feet of the hunter and even at the dog and, taking advantage of the confusion, run away. Therefore, if the sable lurking on the branches, it is better, without delay, to aim and shoot down the beast with a shot. Also sable can be hammered into a hollow . In this case, you need to tap the trunk to determine the boundaries of the hollow. After that you should cut a hole hole by hole in the barrel, and when you reach the sable, press it with a mitten. Another favorite place of sable , where he hides from the chase – crevices in the stones and various burrows . In this case it is worth stocking up the probe. Some lovers of hunting prefer to smoke animals, but experienced hunters are not advised to do this, as in this case the sable skin will spoil. The network can be an aid to hunting with dogs. In the event that the sable lurks in a very deep hole and neither expels nor smokes it from there , the hunters cover the entrance to the hole with a net, pressing it to the ground as much as possible. After a time when the beast expelled the hunger from the hole, the hunters take the prey. When the snow layer becomes so deep that hunting with dogs becomes impossible , a variety of traps are used – traps, dodgers, sweeps. These devices have their advantages – they are easy to disguise under the snow. In addition, this method is less dynamic than the pursuit, and requires less effort and time from the hunter. To start the beast you need to feed . To this end, the hunters install a log house measuring 1.5 by 1.5 meters with holes in the walls, into which the bait is put. After the animals begin to regularly go to the trough, you can install traps and traps. Sable hunting by traps is no different from that of a hare . After installing the trap, you need to thoroughly powder it with snow, and in order for the sable not to be alarmed by the absence of animal tracks around the trap, you can print them with the help of the leg of a previously killed animal. It is possible to catch a sable also with the help of a snail – a machine gun . They are diverse, but the design in most cases is similar. It consists of the nut, ochepa and gatehouse. Inside the courtyard of the stuffed pegs put the bait. In the only place free from pegs – the gate – the threshold is put. In the absence of another entrance, the sable crawls under the ochep – a heavy pole – touches the guards, after which the ochel falls and presses the animal to the nut. Obmet – a fine-meshed net with chopsticks-zhivkami – less and less used for the extraction of sable . Mainly because the sable can easily tear the net and escape. However, according to experienced hunters, once a sable running away from the net will never get there again. Do not forget that hunting sable is impossible without a special license. 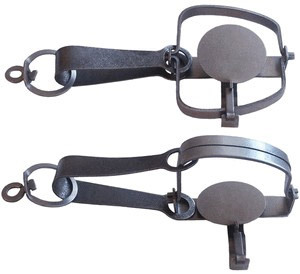 They are issued by the regional management of hunting farms. And even with permission to shoot sables, it is not necessary to destroy animals beyond need. A few decades ago, sable was on the verge of extinction. To this day, this beast in the taiga is quite rare , so you need to be prepared for the fact that you will have to go far for sable. However, the result and the pleasure of hunting are definitely worth the effort.